Jeff Reingold’s major was art, but his business is property management — a career path he began as a UO sophomore in 1969. That first house led to another, then another. Jeff and his late wife, Francine — who earned her bachelor’s and master’s degrees from the UO’s College of Education — married while they were UO students and worked together to build a business from the ground up. But Jeff Reingold also continued studying art, especially printmaking. “Had I known how to make a living in art, there’s a possibility I may have been able to do it,” he says. Today Reingold hopes that a philanthropic gift from Francine and him will help graduates from the College of Design make a living as artists by teaching them how the business side works. Now in its second year, the Reingolds’ initiative gives College of Design students practical lessons from practicing professionals. 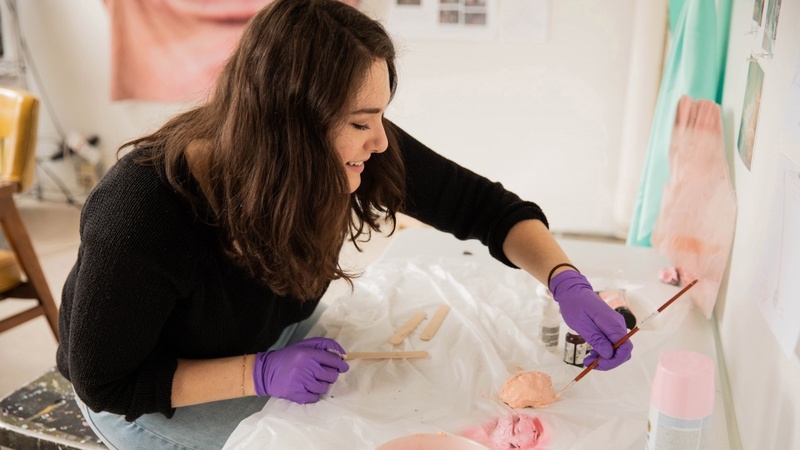 Students tour galleries, meet with artists and curators, and attend workshops on the nuts, bolts, dollars and cents of the art world. For Master of Fine Arts candidate Aja Segapeli, a visit from Portland curator Ashley Stull Meyers was invaluable. During a series of panel discussions in Portland this June, graduate students had more opportunities to hear from art professionals. The panels covered topics such as public arts, how to launch new initiatives and tips on how to sustain a business or practice. In the fall, the college will offer a workshop entitled “Financial Literacy for Artists, a Crash Course in the Essentials of Finance.” Those are the kinds of important topics and practical advice, Reingold says, that many aspiring artists miss in college, because most of their time, naturally, is focused on creating art. As a UO undergraduate, Reingold worked extensively with friend and mentor LaVerne Krause, a faculty member who, as the only woman in the Department of Fine and Applied Arts, founded the UO’s printmaking program. A gallery that showcases new student work weekly in Lawrence Hall is named in her honor. Reingold’s work included making silk-screen posters for Erb Memorial Union events, including one for a Jimi Hendrix concert. But an art career wasn’t in the cards for Reingold. Neither was the family business; his great grandfather started Portland landmark Reingold’s Jewelers in the early 1900s. He and Francine continued with the rental properties, and he founded Income Property Management Co. in 1974. Today he’s president of the company, which has offices in Portland and Eugene. The Reingolds have also given generously to the Charles H. Lundquist College of Business, UO Libraries and other areas of campus. For Reingold, this recent gift to the College of Design is a way to support creative pursuits that society too often dismisses as superfluous.